Joe Higashi is finally out of the hospital, and the entire gang (Terry Bogard, Andy Bogard, Mai Shiranui) is invited to his victory party for getting back in the ring. While there, they are confronted by Sulia, a poor young girl who needs serious help. During the search, Terry becomes enamored with Sulia, despite his own objections to her advances. When Laucorn transcends mortality, a final battle takes place but Laucorn proves too powerful for any of the fighters. Sulia sacrifices her own life to stop Laucorn, but when he dies Mars, the actual god of war, appears to reclaim his armor. Nothing Terry can't handle. Terry defeats the god of war, and they all escape just in time to watch the fireworks. 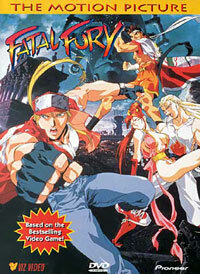 The above description came from Fatal Fury: The Motion Picture Review and a Fatal Fury website, and was edited by yours truly (contact me).